Theodore Epp was born on January 27, 1907, to missionary parents working with the Hopi Indians of Arizona. As a young man he attended the Southwestern Baptist Theological Seminary and Biola College. Moving to Nebraska he purchased a daily fifteen-minute slot on a local radio station. 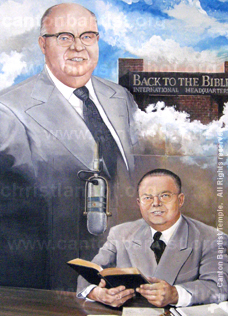 From that small beginning grew the international radio ministry of Back to the Bible Broadcast, with offices in nine overseas countries. Today it is almost impossible to separate the names of Theodore Epp and Back to the Bible. They are virtually one and the same. Because of Mr. Epp’s concern and interest in missions, he set aside one day a week in his broadcasts to challenge listeners with the need for worldwide missions. The first known convert from Back to the Bible’s outreach was a young lady who later became a foreign missionary, receiving her support from faithful radio listeners. In all, Back to the Bible took on the financial and prayer support of 300 missionaries serving around the world. From the earliest days of broadcasting, Theodore Epp had a deep concern for reaching children and young people. As a result, Saturday broadcasts featured youth singers and the stories of Danny Orlis. Missions was also a regular part of this program. As a follow-up to the radio ministry, two monthly magazines – the Good News Broadcaster for adults, and Young Ambassador for youth – were added as literature supplements. Bible study and devotional books became a regular part of the ministry as well. In 1984, after completing some 45 years of preaching and teaching through radio broadcasting, Theodore Epp appointed Warren Wiersbe as director and speaker for the worldwide ministry. In 1990 Woodrow Kroll assumed those responsibilities, carrying on the founder’s vision and desire to call people BACK TO THE BIBLE.